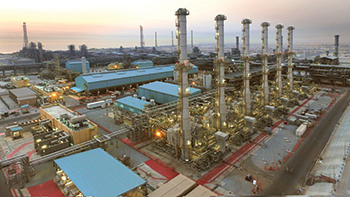 A KNPC facility ... the Clean Fuels Project aims to upgrade refineries. The Fluor-led joint venture with Daewoo Engineering & Construction and Hyundai Heavy Industries is responsible for engineering, procurement and construction as well as associated pre-commissioning and testing support for the Mina Abdullah Package 2. After commissioning, both the Mina Abdullah and Mina Al Ahmadi refineries will have a capacity of 800,000 barrels-per-stream day to supply local and international demand for clean fuels meeting stringent environmental requirements. The American Society of Safety Engineers recently recognised the project with its 2018 Gold Award in Health, Safety and Environmental Excellence. The workforce has achieved 60 million work hours without a lost-time incident.